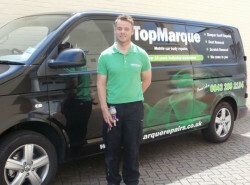 Top Marque Repairs are a mobile car body repair business servicing all of Sussex, Surrey, Hampshire and Kent. It is run by Neal Godfrey who has over 22 years car bodywork repair experience. He is also approved by Mazda to carry out paint repairs. Top Marque Repairs repair car scratches, bodywork and paint to to the highest standard using Standox Paint Systems. Location not listed? Call us to find if we can come to you to repair your vehicle. Its important to get paint scratches repaired as soon as possible. Not only do they make your car look scruffy but left longer term they can lead to rust problems. Cars can pick up dents and dings through their life. If you’ve been putting off getting them fixed, thinking it may be too expensive, give us a ring for a no obligation quote. We repair all types of car bumper. 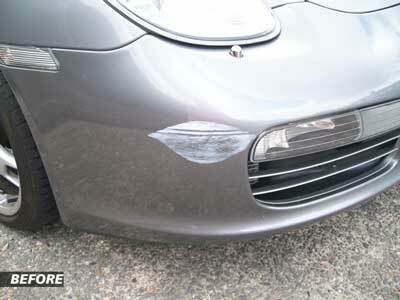 Plastic bumper cracks , scuffs or dents are repaired back to original manufacturer condition. 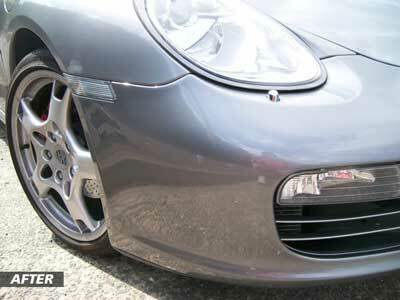 We specialise in all types of car paint repair. We can restore your damaged paintwork back to its previous glory in a matter of hours. The owner of this grey Porsche Boxster came out of Waitrose to see her beloved car covered in another cars paint. Bumper scuffs like this are reasonably common. They make your car look untidy and can be fixed in a matter of hours. We use manufacturer specification paint to get cars back to "as new" condition. "Your attention to detail is second to none and we would be happy to use you for all our body repairs"
Managing Director, Chandlers Mini, Rustington. "Prompt, reliable service and excellent quality! I wouldn't trust my Audi TT with anyone else!" "My Mercedes ML had a nasty dent on the off side rear wheel arch. Neal did a great job in repairing the damage and respraying to a point where you would not know it was there. Good, reliable and courteous service, certainly knows his stuff! Thanks Neil." "Neal is a star…..well 5 star actually. He has just re-sprayed the rear bumper and polished out a few other scuffs from my Lexus IS250. Not only is the colour a perfect match but it’s a beautiful finish. 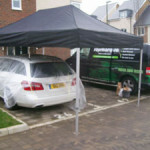 For a mobile unit the price was very competitive and I wouldn’t hesitate to recommend him to friends." Scratches and paint chips not look unsightly. They also negatively affect the value of your car. Just look in a car price guide book. A car in tatty condition often sells for at least £500 less than one in mint condition. The good news is that we make the process of getting your car repaired simple. We come to you - at your place of work or home and fix your car. 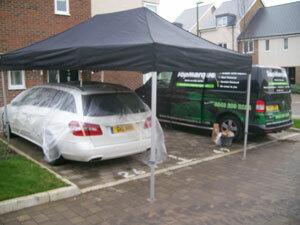 To mitigate against bad weather we have gazebos to keep your pride and joy dry. The paint is then dried using our dryers, meaning you can be on your way within hours of us calling. To get a no obligation free quote, please fill out the estimate form at the top of this page.